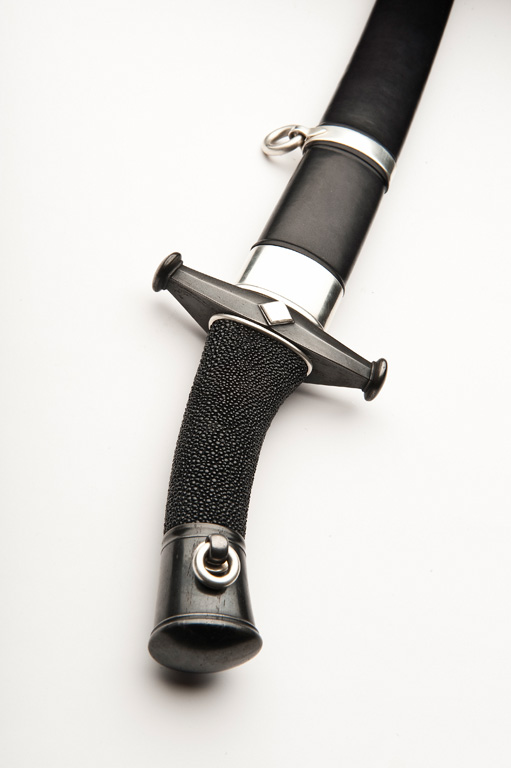 A saber of a type that was used in the 10th and 11th centuries. 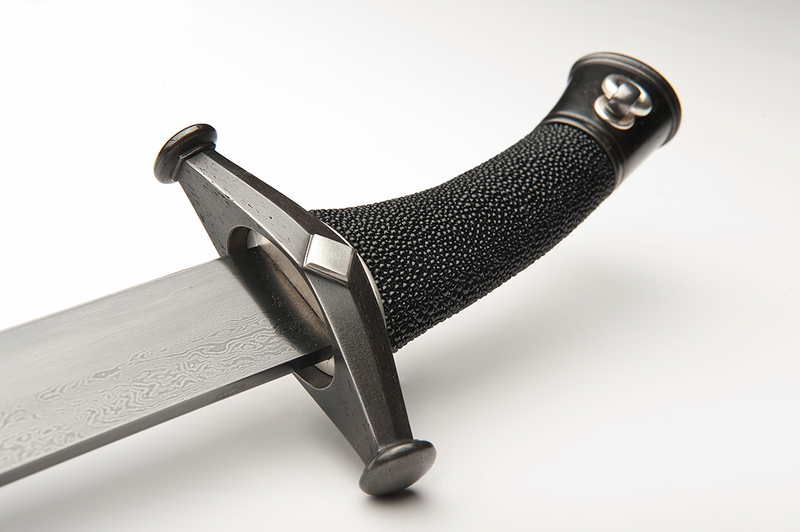 It is one of the earliest designs of the single edged curved blade that was in use in eastern europe. When my viking ancestors rowed upon the russian rivers to reach Kiev and Constantinople, warriors on horseback sat looking at them from the banks of the river armed with swords of this type. Although of a historical type and made to be faithful to original weapons in construction and function, this sword is given a timeless design. The 865 mm long blade is a straight random patterned laminate of some 800 layers of SIS 1780 and 15N20 steel. The hilts is constructed the traditional way so that the guard encloses the wood core on top of a close fitting silver collar. The construction is similar to how an axe head is affixed on its haft. Pommel cap and guard are forged from century old wrought iron that is etched and lightly polished to bring out the grain. The beech wood grip is covered by black ray skin. The tang follows the full length of the grip and is secured at the pommel cap by a an iron rivet that also holds a solid silver ring for the wrist loop. The saber weighs 895 grams without scabbard. It is designed to feel light in the hand but to gain momentum once it is dedicated to a cut. The edge is fine and sharp: not a helmet splitter, but a slashing weapon for lightly armed opponents. The birch wood scabbard is lined with fur and covered with fine goat leather. The sterling silver mouth locket is shaped so that it is countersunk into a matching opening in the front of the guard when the saber is fully inserted into the scabbard. Two sterling silver bands holds two solid silver rings for attachment to a belt or baldric. 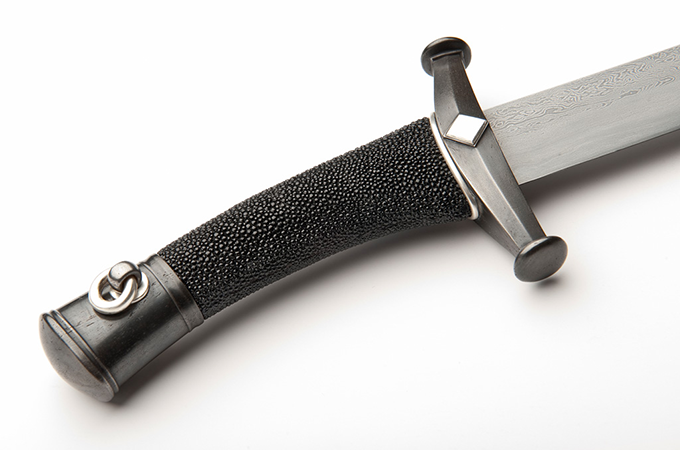 The chape at the end of the scabbard is also fabricated from sterling silver. In all almost 90 grams of sterling silver was used for the mountings of the sword.